Have you ever come across statements online, or overheard people in dialogue, claiming that there is just no evidence supporting the effectiveness of incorporating technology in the educational process? Doesn’t that just drive you nuts? This is simply an uninformed and wrong-headed claim. Google “evidence supporting effectiveness of technology in education” and check out the results. No evidence? Think again. Of course, here on this site, were focused on one specific technique that relies on technology make teaching and learning more effective – the flipped classroom or flipped instruction model. Flipped teaching and learning is making further inroads in schools across the world every day as teachers across the world discover and adopt it. “The combined first-time pass rate under the old, traditional learning style program was 83.9 percent, college data show. The combined first-time pass rate for the new program is 96 percent, a more than 12 percentage point increase. The Flipped-Classroom Approach: The Answer to Future Learning?, Jan. 2014, The European Journal of Open, Distance, and E-Learning. This is the first part of a pilot we ran at The College of Westchester in 2014. I’ll soon be publishing results from the full pilot (which included 4 additional classes), which showed similar encouraging results. 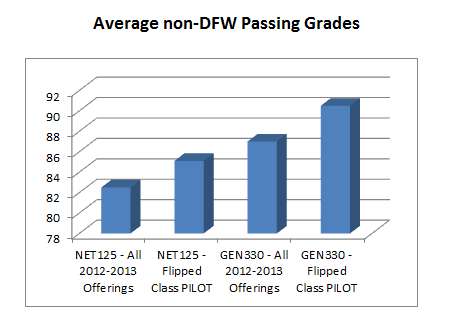 “The most startling and beneficial result of the Partial Flipped Class pilot was the drastic reduction of DFW rates (Ed Note: DFW = D’s, F’s, and Withdrawals). Freeman is now part of a new wave of Washington college instructors who are rethinking the college lecture hall … Some are seizing on a relatively recent idea: “flipping” the class, by turning a lecture or other basic materials into homework, and spending more class time in practice and problem-solving. In this article, teacher and administrator James Szoka writes about his experience as an administrator at a rural secondary school district in America. He observed teachers who implemented a flipped classroom with materials they designed and created. Over 250 video podcasts were made district-wide to provide content instruction. A professor at the University of British Columbia, Louis Deslauriers, studied 850 undergraduate science students taking a required physics course. At the beginning of the term, students were placed in two groups. Both groups for the first 11 weeks of the course received instruction in the typical lecture delivery format by competent and well regarded instructors. At the 12 week mark, students in group 1 received instruction in a flipped classroom manner. Class time was spent on problem solving and discussion and content acquisition was left to be done by the student outside of the classroom with reading assignments. Students in group 2 continued in the typical lecture delivery format for the 12th week. At the end of the 12th week, all students were given a test to determine their acquisition of content for the 12 week period. The test was scored on the correct out of 12 and the results are pictured above. Group 2 using the lecture delivery method had an average score of 41% and Group 1 had an average score of 74%. This last study makes a key point, which is that there are few formally structured, rigorous studies focused on outcomes. It is also important to note that not all published findings and studies focused on the flipped classroom have reported positive results. For example, this recent report on EDUCAUSE did not find any statistically significant improvements in flipped classrooms in a couple courses studies over 2 years. There are many factors that play into the effectiveness of flipped instruction, and only time will tell if continued professional development and experience with the technique yield predictable, repeatable increased performance. There has been consistent growth of the use of this technique over the 7+ years since Sams and Bergmann began their efforts (which IMHO have been a primary catalyst in this grassroots movement). 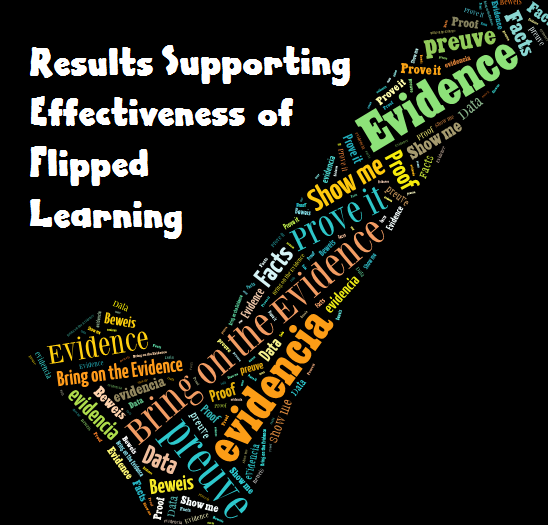 As more and more teachers gain experience and share and apply best practices, I have little doubt that there can be continued evidence coming forth supporting the effectiveness of flipped teaching and learning when carefully structured and leveraged. It remains to be seen if administrators, parents, school boards, and other stakeholders governing education ultimately help or hinder the potential that is clearly displayed in these encouraging findings. The New Free Flipped Teaching and Learning Resources eBook is Here! Over 70 Reasons Why you Should Flip Your Classroom! 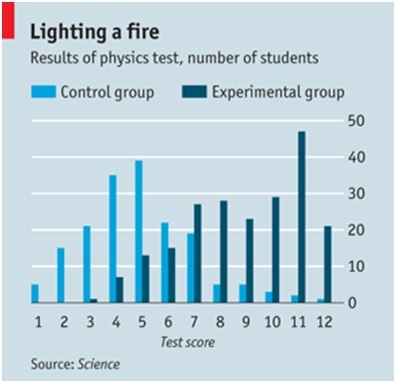 Most of these studies involve college students, not secondary schools. That’s unfortunate for folks like me (8th grade teacher). Can we cast the net wider to find more results on middle/high school students? We would especially like to see the impact of flipped instruction on subgroups: race, class, disability, ELL, etc. I *believe* that the model can benefit students with disadvantages (as long as they have tech access), but I do not have data to prove that….